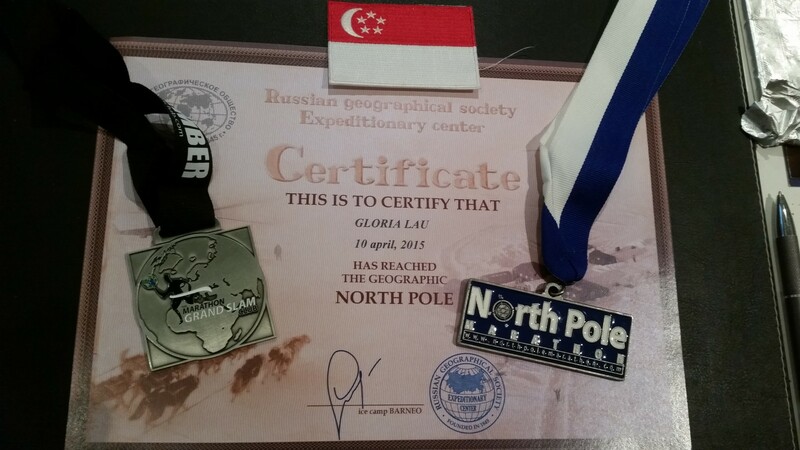 Gloria Lau recounts the North Pole Marathon | JustRunLah! 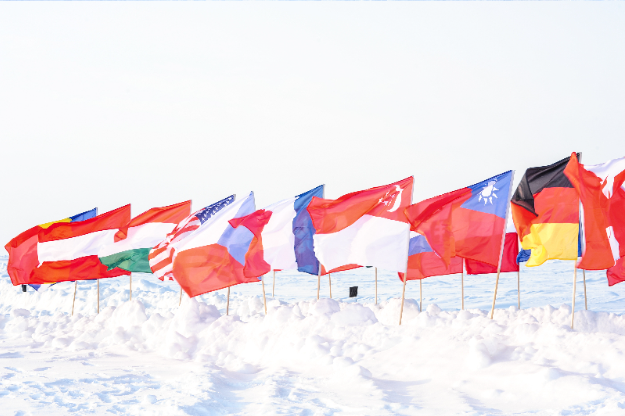 After completing the 7 continents, and becoming a member of The 7 Continents Marathon Club, I asked myself if I wanted to take the challenge further by running on the Arctic Ocean at the North Pole, thus qualifying for The Marathon Grand Slam Club. 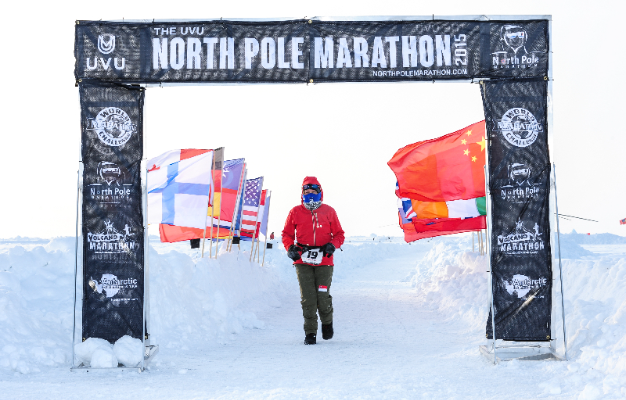 The North Pole Marathon is billed as the ‘coldest marathon in the world’, with the competition seeing runners jogging through the frozen arctic floes, with 6 to 12 feet separating the runner from 12,000 feet of Arctic Ocean. The Arctic is not the 8th continent, but a floating mass of ice. 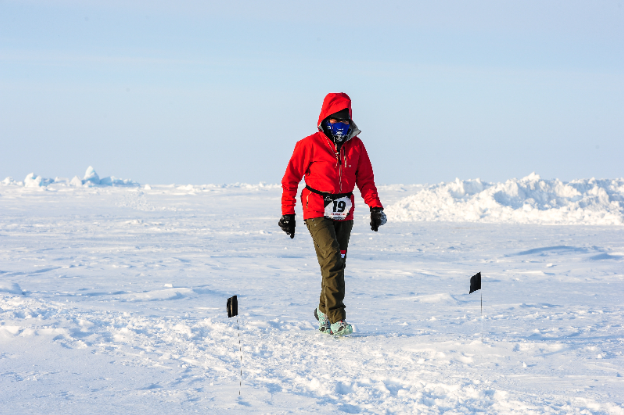 The mass of ice is constantly moving so the race route would inevitably drift from the starting point! The other daunting issue were the polar bears, and the threat was real. 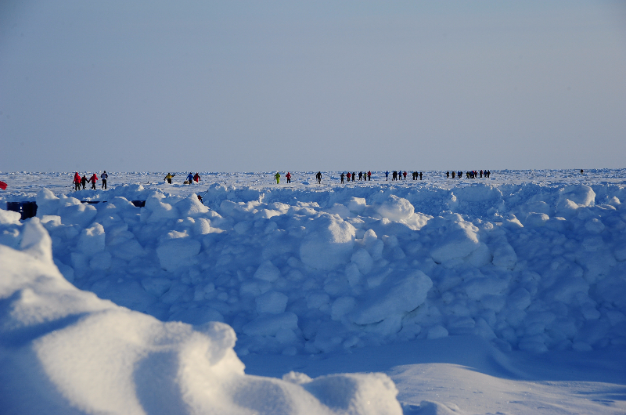 A week after the marathon, polar bears were sighted within 20 metres of the tents at the North Pole. This is why the organisers engage several Russian sniper guards to monitor the event each year. The process of establishing a camp at the North Pole is extensive. In late March, after 6 months of darkness, the sun finally appears in the North Pole. Helicopter crews and Russian paratroopers will search for a suitable ice floe at the North Pole to build the camp that will cater for the North Pole Marathon. The course is then mapped by Richard Donovan, organiser of the North Pole Marathon, and the first man ever to have done it back in 2002. The ice floe must be robust enough for a plane to land and should be stable for a few weeks in April. Advance personnel, including a tractor driver and a tractor is dropped at the North Pole to construct a temporary runway and camp for the North Pole Marathon. I started my journey by flying from Singapore to Frankfurt and then making a connection to Copenhagen /Oslo and Longyearbyen, which is situated on Spitzbergen Island (part of the archipelago of Svalbard) off the coast of Norway. The competitors met at the Radisson Blu Hotel and were briefed to get ready for the flight to the North Pole. There were 44 competitors representing 22 countries this year. We were supposed to leave on 7 April, but were soon advised that there was a delay due to damage to the landing gear of the aircraft during landing and a replacement aircraft was arranged. 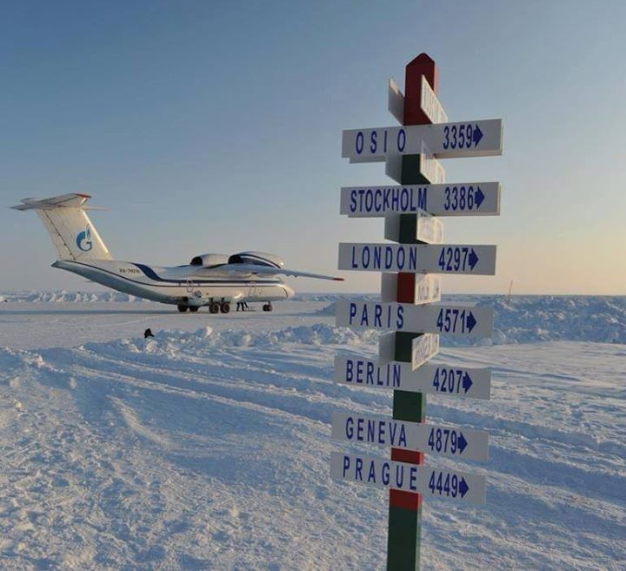 The AN-74TK-100 (Antonov) jet flew us to an international North Pole Camp called Barneo situated between 89N and 90N, drifting in the high Arctic Ocean. The Antonov would return to collect us approximately 36 – 48 hours later. The flight duration was 2½ hours each way. The AN-74TK-100 is a converted cargo plane that is purposefully built for such conditions. An exceptional medium-sized transport aircraft, it belongs to the category of STOL aircrafts: Short Take-Off and Landing aircrafts. By design, the front of the plane is used for seating and the rear is utilised for cargo storage. Its unique design and a robust fuselage provide for a perfect performance in hostile weather conditions and shorter landing strips. Barneo Ice Camp is the name of the temporary base camp that is put in place for the North Pole Marathon. It is a unique complex on a drifting ice floe in the Arctic Ocean in the immediate proximity of The North Pole. 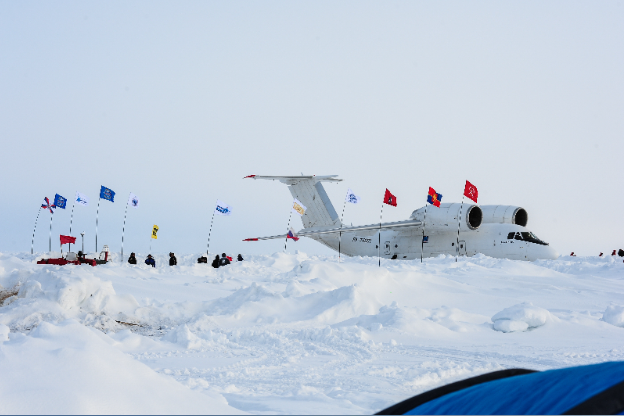 The complex includes a runway and a tent camp constructed for a period of three weeks each April, where it also caters for scientists and explorers. I did not suspect that the weather conditions would be harsh. As I had been to the Antarctica I imagined that the climate would be somewhat similar. What a surprise! The Marathon began at 1215 GMT under blue skies but very cold and windy conditions. The temperature was -37⁰C, but the wind chill factor made it feel more like -51⁰C. Due to the poor weather conditions and limited visibility, the organizer decided that runners should do twelve laps rather than the usual eight, so that one can return to the first aid tent to warm up and replace running gear. I had ordered a balaclava which I was to collect in Copenhagen, but that never arrived! After the first lap, I realised that I’d had the wrong shoes as my shoes and socks were soaked. I had to return to the tent after each lap to dry my shoes and change my socks, and that was totally causing me to lose momentum. By the third lap, I decided that this was getting me nowhere and switched to my snow boots which were stiff and heavy, but at least they kept my feet dry! My goggles were also fogging up so I had to discard them and use a pair of sunglasses instead. That exposed my face and I soon developed frostbite. By the time I’d finished 8 laps (28km), the temperature had fallen further with very poor visibility. Several other runners were also suffering hypothermia and frostbite. The doctor examined me and while I was only diagnosed with a slight hypothermia, he suggested that I should stop as visibility was low, weather conditions worsening and the risk of injury was high. It wasn’t much of a run anymore as the snow drift was pretty deep and -41ºc and a windchill worsened to -55ºC. 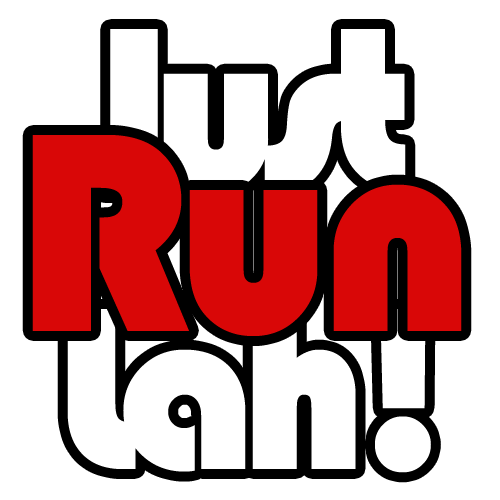 That was a very difficult call to make, and other runners suggested that I should not continue. I guess they were concerned as I was the oldest runner! I decided to let my head control my heart as I considered the risk and the consequences and regard my run as a half marathon. With this, I have thus become the first Singaporean member of the Half Marathon Grand Slam Club (Women).